Stater Bros. Markets is a gigantic American retail supermarket discount chain. The company was founded in California in 1936. Stater Bros. Markets have 171 locations in total and is a big family with employs 18,000 employees. Stater Bros. sells things that people need on a daily basis, such as bakery, dairy, general grocery and even pharmacy. Among the total of 171 Stater Bros stores in the U.S., it is likely that there are vacancies at a lot of stores at any given moment. To check out, you should go to the official job application website of the company. You can visit the official job application website by clicking here. Choose the one that fits with your goal, among corporate, store, distribution careers. A page with the list of jobs and descriptions will open. Press “Start Application” at the bottom of the new page. To proceed, you need to create a new Stater Bros account, then sign in. You will create your account for free. 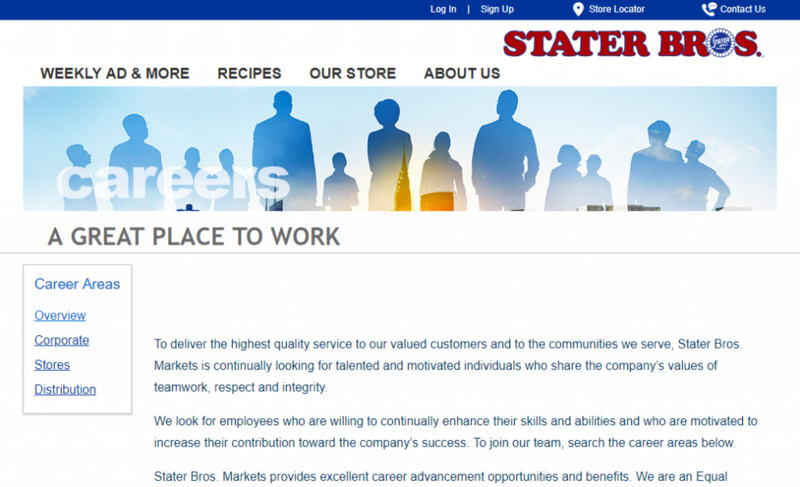 Today, Stater Bros is one of the leading employers in counties of Southern California. They have over 160 grocery stores and have hired around 18,000 employees. To continue their expansion, they need more quality employees at entry-level jobs that can continue their tradition of good service. Clerks: Their primary responsibility is to unload and process customer orders quickly and error-free. As such, they must have a proper working knowledge of money exchange and cash register operation. Courtesy Clerk: Many entry-level employees begin as courtesy clerks, which are commonly called as baggers. Their primary role it to bag customer merchandise and assist customers in transferring groceries to their vehicles. Afterwards, courtesy clerks must gather and return the shopping carts to the store. They can also perform price-checks and checkout area cleanups. General Floor Merchandising Clerks: They keep the sales floor orderly and the shelves well-stocked. They provide general assistance to customers and answer customer inquiries promptly and politely. Janitors: They keep the entire store clean throughout the day and make sure that the exterior is also as clean as possible. They usually have longer shifts than other entry-level jobs because they need to clean the store before closing. Additionally, they help stock room employees perform regular supplies cleanup. Meat Clerk: They manage and maintain the store’s meat section and ensure that the displayed meat products are fresh and high-grade. They also cut the meat according to the customer’s preference before weighing and wrapping. Due to the nature of the job, they must maintain high tolerance against cold temperature. Stater Bros normally has regular job openings. However, they do not have an online application portal. As such, applicants must personally send in their application forms and resume at the concerned store. Before submitting the application form, applicants must ensure that they are qualified for the job. Normally, the stores specify the qualifications as well as the necessary documents for the position. Applicants must also submit the necessary documents to increase their chances of getting the job. Stater Bros is known for being one of the companies that requires drug screening from their applicants. As such, applicants must make sure to have a recent medical certificate before submitting the application form. Applicants can request for an update on their application through phone or email. They can also check on their application personally, but they must be sensitive to the workplace situation and only request to speak with the manager during slow hours. Stater Bros is constantly looking for potential long-term employees that can perform efficiently and maintain and practice the core company values. The company hires applicants regardless of their color or sexual orientation. However, they require a minimum age of 16 years old to be part of Stater Bros. Since Stater Bros does not offer online application and printable application forms, interested applicants must personally request for an applicant form at the concerned store. They can fill up the application form at home and deliver it at the store within the application deadline.